*ToyotaCare covers normal factory scheduled service for 2 years or 25K miles, whichever comes first. See Toyota dealer for details and exclusions. Valid only in the continental U.S. and Alaska. Toyota is devoted to safety and dependability, and proper vehicle maintenance is important to both. That's why we include a no cost maintenance plan7 with the purchase or lease of every new Toyota for two years or 25,000 miles, whichever comes first. 24-hour roadside assistance8 is also included for two years, regardless of mileage. We'll make it easy to take care of your new Toyota. 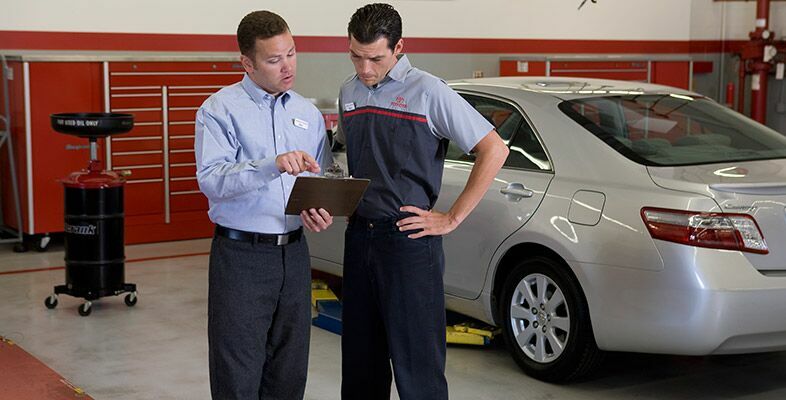 ToyotaCare features 24-hour roadside assistance11 for those days when you need a tire changed or a door unlocked. 1Manufacturer's Suggested Retail Price, excludes the Delivery, Processing and Handling Fee of $825 for Cars, $885 for Small/Light Trucks (Sienna, RAV4, RAV4 EV, Highlander Gas, Highlander HV, FJ Cruiser, 4Runner, Tacoma and Venza), $1100 for Large Trucks (Tundra), and $925 for Large SUVs (Sequoia and Land Cruiser). (Historically, vehicle manufacturers and distributors have charged a separate fee for processing, handling and delivering vehicles to dealerships. Toyota's charge for these services is called the "Delivery, Processing and Handling Fee" and is based on the value of the processing, handling and delivery services Toyota provides as well as Toyota's overall pricing structure. Toyota may make a profit on the Delivery, Processing and Handling Fee.) Excludes taxes, license, title and available or regionally required equipment. The Delivery, Processing and Handling Fee in AL, AR, FL, GA, LA, MS, NC, OK, SC and TX will be higher. Actual dealer price will vary. 22014 EPA-estimated mileage. Actual mileage will vary. 2015 EPA-estimated mileage. Actual mileage will vary. 3EPA-estimated driving range 103 miles when vehicle is fully charged. Excludes driving conditions. Actual mileage will vary. 42014 EPA-estimated mpg equivalent. Actual mpge will vary based on driving habits, charging practice, battery age, weather, temperature and road/traffic conditions. Battery capacity will decrease with time and use. For more information on mpge and range, please see www.fueleconomy.gov. 52014 EPA-estimated combined miles per gasoline gallon equivalent. Estimate includes consumption of electricity and gasoline energy during EV Mode operation. Actual results will vary for many reasons including driving conditions and how you drive and maintain your vehicle. 62014 EPA-estimated 51 city/49 highway/50 combined mpg estimates for Prius Plug-in. Actual mileage will vary. 7Covers normal factory scheduled service for two years or 25,000 miles, whichever comes first. See Toyota dealer for details and exclusions. Valid only in the continental U.S. and Alaska. 8Prius Plug-in Hybrid comes with an extra year of roadside assistance, for a total of three (3) years from date of first use. Does not include parts and fluids, except emergency fuel delivery. 9Excludes those items listed in the Warranty and Maintenance Guide under Special Operating Conditions. 10Consult the vehicle's Warranty and Maintenance Guide for factory-recommended services and intervals. 11Does not include parts and fluids, except emergency fuel delivery.